Motto: "Honoring Our Past, Positioning Our Future"
Tolleson /ˈtɒlᵻsən/ is a city in Maricopa County, Arizona, United States. According to the 2010 census, the population of the city is 6,545. The city was incorporated in 1929, and named after founder W.G. Tolleson. Tolleson is located at (33.450354, -112.255106). According to the United States Census Bureau, the city has a total area of 5.6 square miles (15 km2), all of it land. Whoopee Daze Festival at Veterans Park This 4 day event will include carnival rides, softball, pageants, corn hole competitions, a parade and live entertainment. 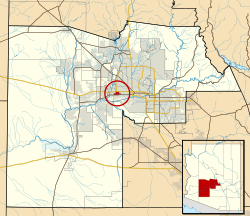 Tolleson, Arizona Facts for Kids. Kiddle Encyclopedia.